Getting engaged is one of the most important moments in a person's life. Done right, it's an unforgettable moment that marks a new beginning for the happy couple. We wanted to explore the state of modern engagements and weddings, so POPSUGAR Insights recently surveyed over 1,200 married or engaged POPSUGAR readers to learn how they planned their weddings and honeymoons. 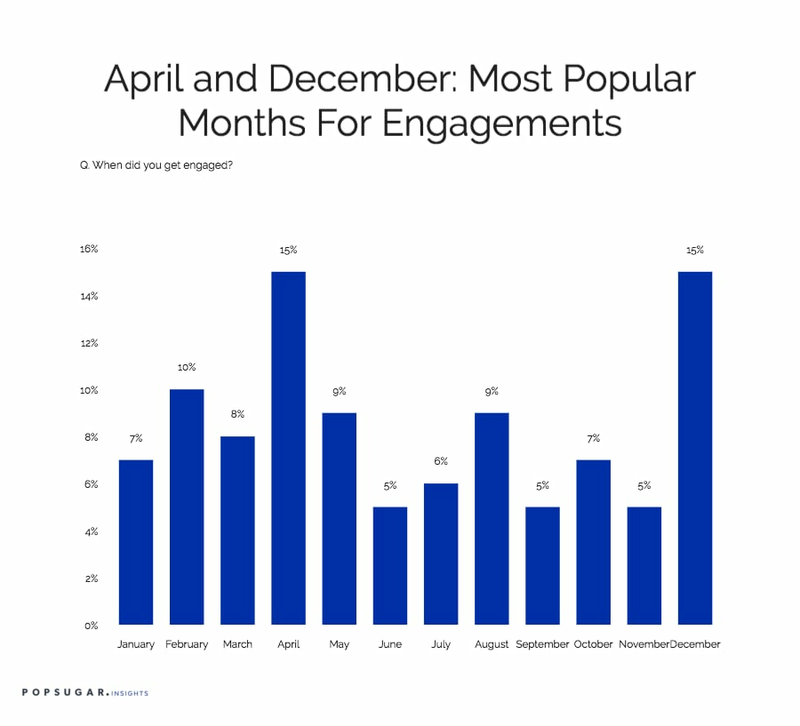 Overall, we learned that the most popular months to get engaged were April and December, and that 81% of our readers had an engagement that lasted over seven months, with nearly half of readers having an engagement of over 12 months. An important part of getting engaged is finding the perfect ring. Overall, 59% of POPSUGAR readers said that their partner picked their engagement ring, and 95% of readers were happy with the ring their partner selected. Half of readers had an engagement ring that was larger than one carat, and 11% went a nontraditional route and did not have a diamond as their engagement ring.